September 12, 2013 September 12, 2013 k3fitLeave a Comment on The importance of a good stretch! The importance of a good stretch! One of the most overlooked areas of a good health and fitness program is stretching. It is almost an afterthought for most people, but once the workout is done that’s actually when the real work inside your body starts happening. The rest/recovery/healing time. The best way to kick it off is to do a cool down with a few minutes of stretching your worked muscles out. Why stretch after and not before working out? The simplest answer is because your muscles are cold and prior to any kind of workout I strongly suggest warming up the body to prepare the muscles for activation, you want to get your heart rate up a little ,raise your temperature about 1 degree, get the blood flowing to your muscles. 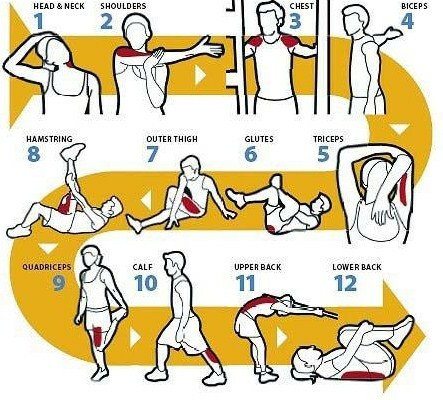 Once you are totally warmed up and you want to do some light stretching go for it as this can help your muscles prepare even more for the strain they will be under during your workout. Stretching muscles when they are cold is like taking a rubber band outside in cold temps, it’s not very elastic at that point. You want to hold your stretches for a good 20-30 seconds. A quick 10 second stretch is not really beneficial to you. Your goal is muscle elongation to improve flexibility, which is a slow process but if you stay at it this can happen. Will stretching make me stronger and recover faster? In a way yes it actually can, when we stretch we actually break and tear up little muscle fibers allowing them to get longer than they were before. The small little tears are repaired during our recovery and the gaps are bridged with new muscle fiber. It also helps blood flow circulation to your muscles, one of the most crucial factors to good muscle recovery is getting those nutrients to the muscles quickly, so if your circulation is good then you can have a quicker recovery. One of the reasons why more in shape athletes recover quicker is because they have good circulation. Previous Wacky Wednesday Veggie Addition – Kale!